-Monsieur: 80 bd. Richard-Lenoir. 11eme. Richard-Lenoir or Saint-Ambroise. Not the best restaurant, but the closest to my house! Good looking and nice atmosphere. French food. Very expensive for what it is. -American Bistrot, 74 rue de la Folie Méricourt. 11ème. Oberkampf. American food and brunch. -Pierre Sang, 55 rue Oberkampf. 11ème. Oberkampf. Very creative food. Pretends to be laid back but classy and expensive. -Bozart Bistro : 9 rue Jean-Pierre Timbaud. 11eme. Oberkampf. A young team tries to capture the old french simple restaurant style. A little expensive. -Astier: 44 rue Jean-Pierre Timbaud. 11eme. Parmentier or Oberkampf. Typically french. Used to be expensive but great. It is now expensive and worthless. Only the cheese platter and the wine selection has remained good. -Les P'tites Indécises, 2 rue Trois Bornes, 11ème, M° Parmentier, 01 43 57 26 00. Nice terrasse, especially when it's sunny. New team. Very good food and very good brunches at a decent price. -Le Charbon, 109 rue Oberkampf, 11ème M° Parmentier. The bar that started all the trend of rue Oberkampf. Still a high place for a cafe, a drink, a brunch, a lunch, a dinner, and even a club in the back (Le Nouveau Casino). -Le Mecano, 99 rue Oberkampf, 11ème M° Parmentier. Another one of those bars/restaurant/brunch places. -Le Plein Soleil, 90 avenue Parmentier, 11ème M° Parmentier. One of the most beautiful terraces of Paris, it's worthwile on a sunny day. The food is average and the pricing is correct. -La Gouttière, 96 avenue Parmentier, 11ème M° Parmentier, 01 43 55 46 42. Cheap restaurant and bar with a very nice student atmosphere. Sometimes there is live music. -La Caravane, 35 rue de la Fontaine au Roi, 11ème, M° Goncourt, 01 49 23 01 86. Trendy place that serves as a bar, a café, a brunch place, a hang out place and a restaurant. Decent prices, nice atmosphere. -Le Cannibale, 93 rue Jean-Pierre Timbaud, 20ème, M° Couronnes, where you can also have a brunch. -Place Ste Marthe, a cute square between Belleville and the Canal (Metros: Goncourt, Colonel Fabien, Belleville...). Three cafés/restaurants. -Le Bistrot du Peintre, 116 avenue Ledru Rollin, 11ème, M° Ledru-Rollin, 01 47 00 34 39. Classic french food, reasonable prices. -Au 20ème Art. 46 rue des Vignoles. 20ème. Buzenval. Excellent modern french cuisine in a remote area of Paris. -Chez Paul. 34 Rue de Lappe. 11eme. Bastille. Good traditional food in a good loking place but a little pricy. Very busy. -Café de l'Industrie. Several places around the 16 Rue St Sabin. 11ème. Bastille. Beautiful convenient place. Not too expensive. Food OK. Also serves brunch. -Chez Valentin, 64 rue Rébeval, 19eme, M° Pyrénées, 01 42 08 12 34. Very good hidden restaurant with specialties from all over the world. Decent prices. -MK2 Quai de Seine. 14 quai de Seine. 19eme. Jaures ou Stalingrad. It's a good movie theater, in an area that used to be gloomy, but that is now renovated and beautiful, along the Canal de la Villette. It also has a cafe and a restaurant. It's OK if you are not too hungry. But mostly, what I like, is to have dinner along the canal. -Le Valmy, 145 quai de Valmy, 10ème, Gare de l'Est. Another option if you want to eat on the canal. -Le Chaland, 2 passage Delessert (on the quai de Valmy), 10ème, M° Louis Blanc, 01 40 05 18 68. Another option if you want to eat on the canal. -La Marine, 55 quai de Valmy. 10eme. Jacques Bonsergent. On the canal. Nice atmosphere, good food, lots of fish stuff. More and more expensive though. -Café Panique, 12 rue des Messageries. 10ème. Poissonnière. 01 47 70 06 84. Excellent upper scale restaurant. Good looking and original. Small portions, but it allows you to taste more dishes! Good wine. Expensive, but it's worth it. -Le Relais de la Butte, 12 rue de Ravignan, 18ème, M° Abbesses, 01 42 23 94 64. Expensive but good and safe in this tourist trap area (I don't mean you risk getting mugged, I mean you risk being served crappy expensive food pretending to be genuine...). -Comptoir Tempero, 124 boulevard Vincent Auriol, 13ème, M° Nationale. Inventive and high quality french food with a slight asian influence, for a reasonable price. -Chez Prosper, 7 avenue du Trône, 12ème, Nation. A typical french brasserie with a nice atmosphere, simple dishes but generous and good quality. -L'Ebauchoir. 43 rue Citeaux. 12eme. Faidherbe-Chaligny or Ledru-Rollin. Good typical french food in a tiny typical restaurant of a non touristy area of Paris. Open late. Has become very trendy and expensive. -Le Reservoir. 16 rue de la Forge Royale. 12ème. Faidherbe-Chaligny or Ledru-Rollin. Used to be the best brunch in town. Buffet. Beautiful place. Dark. Closed on saturday and no brunch in the summer. -Le Baron Rouge. 1 rue Theophile Roussel. 12eme. Ledru-Rollin. Next to the Marche d'Aligre. A "bar a vin" (see Clown Bar). Mostly cold platters with cheeses and charcuterie. And oysters. Good wine of course. Nice old looking atmosphere. -Viaduc Cafe: 43 Av Daumesnil, 12eme, Bastille or Gare de Lyon. Very nice atmosphere, pretty good food, pretty decent price. It reminds me of a New-York cafe that would pretend to be french, but the food is really french! It's located under the Viaduc, the new area built in Paris, between Bastille and Nation, that is very nice to walk around (otherwise, a totally dead area!). -Baribal. 186 rue de Vaugirard. 15eme. Volontaires. Best Quality/Price in town. Open (and full!) 365 days a year for lunch and dinner until 2am. Quite cheap (not as cheap since it's bigger and they have redone the decoration). Huge portions of excellent typical french food. The place doesn't look very nice but trust me: the action is IN the plate! Don't even bother taking an apetizer, you are not hungry enough! Among the great meats, I think their Magret de Canard is one of the best in Paris. They also have a good Pave au Roquefort. You pick the vegetables: you can have either rice, green peas, potatoes, noodles etc... but you HAVE to pick the "Pommes de Terre Sarladaise", delicious potatoes with garlic, mushrooms, herbs...The Brouilly is their best wine. Good Tarte Tatin for a desert, but it's so big, you have to share it! -Le Cafe du Commerce. 51 Rue du commerce, 15eme. Another one of these restaurants that imitate the traditional family style french restaurant. Good looking, good food and not too expensive. -Chartier. 7 Rue du Faubourg Montmartre. 9eme. Metro Grands Boulevards. In a little alley in front of what used to be the club "Le Palace". It's a huge and beautiful place. It closes early. The food is NOT excellent but it is a "must see". It is very very cheap. It is a place where popular workers used to go for lunch and it basically stayed the same. It is very typical, a last of its kind. -Le Tambour. 41 rue Montmartre. 2eme. Etienne-Marcel or Sentier. Good typical french restaurant, open late. Typical old looking nice atmosphere. -Le Marché des Enfants Rouges. It is a covered market, open tuesday to saturday, and sunday morning. So you can buy your own food but there are also some very nice cheap restaurants inside the market: Italian, Maroccan, Greak, Japanese, Lebanese, African, French... And the neighborhood is also very nice. -Excellent brunch at Le Loir Dans la Theiere. 3 Rue des Rosiers. 4eme. St Paul. -Le Jean Bart, 86 rue Saint Antoine, 4ème, M° Saint-Paul. One of the cheapest restaurants in Paris! Which is why the landlord tries to kick them out and replace it by a more expensive one. Of course, not the best food in the world but decent and large portions of typical food, including excellent moules. -Galerie 88: 88 quai Hôtel de Ville. 4eme. A very nice looking café on a side of the Seine where few people walk (maybe because there are too many cars) near the Hotel de Ville. Good simple and cheap food. -Dame Tartine. Place Stravinsky or 2 rue Brisemiche. 4eme. Beaubourg. If you are not too hungry. Not as good and not as cheap as it used to be. Young atmosphere, nice place to hang out. Small meals, hot or cold. -Le Bouillon-Racine, 3 rue Racine, 6eme. St Michel. Mostly a beautiful place "Art Nouveau" with beautiful walls and windows, protected by law. Good food and expensive. The overpricing is compensated by the beauty of the place. -Le Cafe Viennois: rue de l'Ecole de Medecine, 6eme, Luxembourg, Odeon, Saint Michel. A little cafe for students but also good cheap food. -Le Pré Verre, 8 rue Thénard, 5ème, M° Luxembourg Saint Michel. Classical french food with an original touch for each dish. Reasonable prices for lunch, a little more expensive for dinner. -La Petite Périgourdine, 39 Rue des Écoles, 5ème. M° Maubert Mutualité. Excellent traditionnal french restaurant. Simple dishes but excellent products. Expensive, but it's worth it. -Cosi, 9 rue Cujas, 5ème, M° Luxembourg. Corsican restaurant. Good and simple food and wine, nice looking restaurant. Reasonable menu for lunch, a litttle more expensive for dinner. -Le Cafe de la Nouvelle Mairie: 19 Rue des Fosses St Jacques. 5eme. Luxembourg. 01 44 07 04 41. A cafe that became specialised in organic wines and organic food. Not a lot of choice and a little bit expensive, but really an excellent food and wine experience. -Pains Salades et Fantaisies, 22 rue Gay Lussac, 5ème, M° Luxembourg, 01 44 07 07 91. Just a sandwich place but the best in the area. -Chez Polidor, 41 rue Monsieur Le Prince, 6ème, M° Luxembourg, 01 43 26 95 34. Typical old-looking tacky french restaurant. -La Ferrandaise, 8 rue Vaugirard, 6ème, M° Luxembourg, 01 43 26 36 36. Very good but expensive french restaurant. -Le Tournon, 18 rue de Tournon, 6ème, M° Odéon, 01 43 26 16 16. Very good simple french restaurant. A little bit expensive. -La Méthode: 2 rue Descartes, 5eme, Cardinal Lemoine, near the Pantheon. 01 43 54 22 43. A very nice old looking, cosy atmosphere and a nice neighborhood. Good but not as good as it used to be and the bartender is not very nice. A little pricy. -La Truffière, 4 rue Blainville, 5ème, M° Cardinal Lemoine. Excellent french food in a classy and expensive restaurant. -Le Mauzac. 7 rue de l'Abbé de l'Epée. 5eme. Luxembourg. 01 46 33 75 22. A "bar a vin". Good but expensive. * Better though, try La Gueuze, 19 rue Soufflot, 5eme, Luxembourg. 01 43 54 63 00. * Near Montparnasse, tons of them. Typically bretonish or normandish. Cheap. For example rue d'Odessa, 14eme. *Chez Imogène, 25 rue JP Timbaud, 11eme, Oberkampf. A nice one (for sitting) in this area. * 32 Rue de Turenne. 4eme. St Paul. * 16 Rue des Fosses St Jacques. 5eme. Luxembourg. * 42 Rue Dauphine. 6eme. Odeon. * 212 rue de Vaugirard. 15eme. Volontaires. * La Grande Epicerie du Bon Marché, 38 rue de Sèvres, 7eme, Sèvres Babylone. A gourmet supermarket. If you buy things, it will be good but expensive but if you just visit, it's like a free food museum! French culture includes devotion to good food and drinks from France and other parts of the world. * Il Picolo Teatro. 6 Rue des Ecouffes. 4eme. St Paul. * Cucina Napoletana, 6 rue Castex, 4ème, M° Bastille, 01 44 54 06 61. Very good but expensive place. Mostly pasta and sea food. Not a lot of choice but you can trust the waiters. Also a store. * Le Bucheron, rue St Antoine or 9 rue du Roi de Sicile, 4eme, St Paul. Very nice trattoria. You can either just get a hot chocolate, or a croque monsieur, or a Tiramisu, or a real italian dish. Everything is perfect, but a little pricy. *Terra Nera, 18 rue des Fossés Saint-Jacques, 5ème, M° Luxembourg. A little expensive, but yet another good italian with good products. * Chez Bartholo. rue des Canettes, 6eme, St Sulpice or Mabillon. A pizzeria way above average, and a good italian restaurant. * L'Osteria dell'Anima, 37 rue Oberkampf, 11ème, Oberkampf. The smallest italien restaurant in the world! A brother and a sister from Emilia Romagna, famous for its fresh pasta that they prepare in front of you. Elaborated pasta dishes. Not a lot of choice, a little bit pricy but very good. * Very classy, you can have lunch at Armani's, the clothe designer. 149 bd St Germain. 6eme. St Germain des Pres. Or just eat a Tiramisu. * Gustibus, 33 rue Saint-Sebastien, 11ème, Oberkampf. Good and original northern italian food, a little pricy. * Casa Vigata, 44 rue Léon Frot, 11ème, M° Charonne, 01 43 56 38 66. Sicilian place. OK but overpriced in my opinion. * Cacio e Peppe, 18 rue Vulpian, 13ème, M° Glacière, 01 45 87 37 00. Excellent little italian place, quite original (try the spaghetti Caccio e Peppe) but, again, quite expensive (the only cheap italian places in Paris are bad pizza places). -Greek: there are many cheap greek restaurants around Paris. One that I like is "L'ile de Crete" on rue Mouffetard (place de la Contrescarpe), Cardinal-Lemoine. 01 43 26 31 37. *Matsuri, 36 rue de Richelieu, 01 42 61 05 73, (1er, Palais Royal). They have the sushis displayed in front of you and you just pick the one you want. They are all the same price so at the end they count the number of empty plates and charge you. But it is expensive. And the people are not very nice. * Le Foyer Vietnamien, on the corner of rue Pestalozzi and 80 rue Monge, 5eme, Monge. 01 45 35 32 54. Not really a restaurant, it's the cafeteria of a vietnamese center. Full of vietnamese people. Excellent soups or crispy noodles. A must! * Le restaurant d'Indochine, 5 rue Dante, 5eme, Saint-Michel. One of the best vietnamese. * Mirama, 17 rue Saint Jacques, 5eme, Saint Michel. One of the best chinese. *There is a vietnamese/chinese neighborhood in the 13eme arrondissement, Tolbiac. Try Vietnamese: Le Bambou (70 rue Baudricourt); Pho 99 (119 avenue de Choisy); Pho Banh Cuon 14 (129 avenue de Choisy); Hawai (87 avenue d'Ivry). Lao/Thai: Lao Lane Xang (102 avenue d'Ivry); Sukothai (12 rue du Père Guérin). Chinese: Sinorama (23 rue du Dr Magnan); Délices de Confucius (68 Boulevard de l'Hôpital); Traiteur Shandong (88 Boulevard de l'Hôpital). *Doi Southep, 36 rue Saint Sebastien, 11eme, Richard-Lenoir , Saint Ambroise, Oberkampf or Saint Sebastien Froissart. Very good, very original food, very nice people serving, very nice atmosphere, cheap and... close to my house! * Sabraj, 175 rue St Jacques, 6ème, Luxembourg, 01 43 26 70 03. Good looking and very good food. Cheap only at lunch time during the week. Otherwise, quite expensive. * Two very good and decently priced ones Place Gustave Toudouze, 9eme, Saint George. On a very nice little square, including what is supposed to be the first Indian restaurant in Paris. * The indian/sri lanka area is around Metro La Chapelle, 18eme. * Falafel is a Palestinian/Lebanese specialty, but jewish falafel is a slightly modified recipe that you can find in the jewish neighborhood, rue des Rosiers (4eme, St Paul). * Le Souk. 1 rue Keller. 11ème. Ledru Rollin. 01 49 29 05 08. Beautiful and Expensive, but very good. * Similar: "Le 404". 69 rue des Gravilliers. 3eme. Arts et Metiers, Reaumur Sebastopol or Rambuteau. It is beautiful. It is owned by Smain, a famous algerian stand up comedian and actor. Very good couscous but you can also go there for a brunch. Expensive. * Chez Omar, 47 rue de Bretagne, 3eme, Temple. Good couscous in a nice atmosphere, open late in an unusual neighborhood. Not too expensive. * Of course, you can have couscous at La Mosquee de Paris, 39 rue Geoffroy St Hilaire, 5eme, Jussieu or Censier or Monge. 01 43 31 18 14. They have a big selection of various couscous and tagines. * Incredible as it may seem, the one on place de la Contrescarpe, 5eme, Cardinal Lemoine, 01 46 33 07 32, is not too bad! Same comment for some of those that you can find on rue Boutebrie, near the Boulevard St Germain. 5eme. Cluny La Sorbonne. * Good lebanese falafel: Babylon 21 rue Daval, 11eme, Bastille. Also Al Diwan, 30 rue George V, 8eme, George V or Alma Marceau. -Peruvian: Machu Pichu, 9 rue Royer-Collard, 5eme, Luxembourg. 01 43 26 13 13. Good and cheap if you take the menu for lunch. Crowded. -Mexican: a decent and cheap one is "La Perla", corner between rue du Pont Louis Philippe and the 26 Rue Francois Miron, 4eme, St Paul. -News Cafe 78 rue d'Assas. 6eme. Notre Dame des Champs. Nice simple cafe in this area. OK brunchs on Sundays. -L'Inévitable, 22 rue Linné, 5ème, M° Jussieu, 01 47 07 39 99. Another nice one around Jussieu. -Le Cafe Viennois: rue de l'Ecole de Medecine, 6eme, Luxembourg, Odeon, Saint Michel. A little cafe for students. Good pastries and excellent hot chocolate (Austrian/German style). Specialty: chocolate or coffe with whipped cream. -Le Cafe de la Nouvelle Mairie: 19 Rue des Fosses St Jacques. 5eme. Luxembourg. 01 44 07 04 41. Nice little cafe off of the Pantheon. -You also have a cafe inside the jardin du Luxembourg. It is not very good but it is cheap, especially considering it's probably one of the best location you can get in Paris! -Le Piano Vache: a student bar open late, around Luxembourg (6eme), rue Laplace, cheap, alternative crowd and music. -Le Café Universel, 267 rue Saint Jacques, 5ème, M° Luxembourg. Nothing special but sometimes nice and cheap amateur music bands. -Le Cafe de la Mairie, place Saint Sulpice, 6eme. Two floors, student atmosphere. -Rue Saint Jacques: 6eme, Cluny La Sorbonne. A couple of bars: "Polly Magoo", "Le Cloître" for example. Good beer. -Galerie 88: 88 quai Hôtel de Ville. 4eme. A very nice looking café on a side of the Seine where few people walk (maybe because there are too many cars) near the Hotel de Ville. The waiters are not in a rush but they serve very good hot chocolate or mint tea as well as light food. -Le Temps des Cerises: a nice cafe in le Marais, old-looking (wood) rue du Petit Musc, 4eme. -Le Progrès, 1 rue de Bretagne. 3ème. Filles du Calvaire. Next to the market des Enfants Rouges, a nice area. -Cafe Marly. At the Louvre (93 rue de Rivoli). 1er. Palais Royal. Under the columns, next to the entrance (pyramid). Very classy, beautiful cafe, impeccable service. Expensive to eat there (but it's worth it) so you can just have a drink or even breakfast. -Le Sancerre, 35 rue des Abbesses, 18eme. Abbesses. Nice student atmosphere in the area of Montmartre. Open late for drinks and salads or tartines with Pain Poilane. -In Bastille, rue de Lappe and rue de la Roquette: many bars, restaurants, night-clubs and cafes, most are following the trend of the day. Some exceptions: Le Bar Sans Nom, rue de Lappe, Le Café de l'Industrie (where you can also eat, brunch, lunch, dinner...), rue St Sabin, Le Lèche Vin, rue Daval, Le Fontaine, 1 rue Charonne... It's becoming more and more touristy, more and more crowded, more and more violent, more and more... uninteresting. -Rue Oberkampf, between metros Menilmontant and Parmentier. The trendy area of Paris between 1994 and 2004, that is following the same trend as Bastille, not as young, not as cheap, not as nice, not as interesting... Anyway, you can still try La Mercerie, le Charbon (also brunch), le Mecano (also brunch). Check also Les Couleurs on rue Saint-Maur, Le Plein Soleil (also restaurant) at 90 avenue Parmentier, L'Ave Maria, rue Jacquard (go down 2 blocks). For music, see below. -Along the canal Saint Martin: many bars and, when the weather is good, many people drink sitting directly along the canal. Try those: Chez Prune, 36 rue Beaurepaire. 10eme. Jacques Bonsergent (very trendy), Le Jemmapes, 82 quai de Jemmapes 10eme. Jacques Bonsergent (take your glass and drink ON the canal), Le Valmy, 145 quai de Valmy, 10ème, Gare de l'Est (also a restaurant), L'Atmosphère, 49 rue Lucien Sempaix. 10eme. Gare de l'Est (more authentic) or Le Point Ephemere, 186 quai de Valmy (ON the canal), 10ème, Stalingrad, which is also a concert place. -Musee Dapper, moved from avenue Victor Hugo to 35 rue Paul Valery, Metro Kleber, 16eme. Bigger and beautiful museum but not in a beautiful little house with a nice garden in a very fancy place of Paris anymore. They have temporary exhibitions changing every 6 months. No permanent collection. They also have great books. A must! -Nice private galeries: around rue de Seine, rue Calot, rue Mazarine (6eme, Odeon). And one on Boulevard Raspail, near Vavin, 14eme. -Centre George Pompidou (Beaubourg) 1er. Of course. Great permanent collection and, very often, great temporary exhibition. Nice library too. -Musee d'Art Moderne. Avenue du President Wilson. Trocadero. 16eme. Not as good, but sometimes has good temporary exhibitions. -Musee Picasso. 5 rue Thorigny. In le Marais, 3eme. St Paul. Beautiful little house and the art is very well displayed. Contains stuff from different periods. I love it. -Fondation Cartier. 261 bd. Raspail. 6eme. Raspail. Temporary exhibitions of high quality in this new building inside Paris (there is also a Fondation Cartier outside Paris, in Jouy en Josas). Usually contemporary art. -Le Musee Rodin. Rue de Varenne. 7eme. Beautiful house with a garden. Some of the sculptures are displayed in the garden. The back garden also has a cafeteria. In fact it is a must to go there in the summer, enjoy the sculptures for a while, and then spend the rest of the day in the garden, reading, drinking and sun-bathing! I like his sculptures too, and some of Camille Claudel's work is there also. -Le Musee Cluny: 6 place Paul Paineleve. 5eme. Cluny La Sorbonne. Dedicated to the Middle-Ages. Not as boring at it sounds, though!!! -Le Musee des Arts Decoratifs, Next to it. -Le Museum National d'Histoire Naturelle. Jardin des plantes. 5eme. Jussieu. Recently renovated. Good looking. - "La Maison Europeenne de la Photographie" 82 rue Francois Miron, 4eme, St Paul, le Marais. - "Hotel de Sully", 62 rue St Antoine, 4eme, St Paul. Beautiful house in a beautiful garden in le Marais. - "Le Centre National de la Photographie", 11 rue Berryer, 8eme, George V.
-Le Point Ephemere, 186 quai de Valmy, 10ème, M° Chateau Landon, 01 40 34 02 48. It's a nice place to hang out (with bar and restaurant) that also has a place for concerts, usually small alternative bands. -L'Espace Jemmapes, 116 quai de Jemmapes, 10ème, M° Gare de l'Est. A cultural center with plays and sometimes concerts. -Le Quartier Général, 103 rue Oberkampf, 11ème, M° Parmentier. One of many bars on rue Oberkampf that sometimes has live music. -Le Styx, 126 rue Oberkampf, 11ème, M° Parmentier. One of many bars on rue Oberkampf that sometimes has live music. -La Locandiera, 145 rue Oberkampf, 11ème, M° Ménilmontant. Ordinary restaurant, but nice place for cheap live music. -L'Antirouille, 5 rue Moret, 11ème, M° Ménilmontant. A bar with mostly DJs in a little street between Oberkampf and Timbaud. -Le Miz Miz, 6 rue Moret, 11ème, M° Ménilmontant. A bar with free concerts and food, in a little street between Oberkampf and Timbaud. -L'International, 7 rue Moret, 11ème, M° Ménilmontant. A bar with live shows in a little street between Oberkampf and Timbaud. -Le Downtown Café, 46 rue Jean-Pierre Timbaud, 11ème, M° Parmentier. One of many bars on rue Jean-Pierre Timbaud that sometimes has live music. -L'Alimentation Générale, 64 rue Jean-Pierre Timbaud, 11ème, M° Parmentier. The room is not very nice but the music is usually good and the crowd is very nice. -Le Chat Noir, 76 rue Jean-Pierre Timbaud, 11ème, M° Parmentier. One of many bars on rue Jean-Pierre Timbaud that sometimes has live music. -Le Cannibale, 93 rue Jean-Pierre Timbaud, 11ème, M° Couronnes. Mostly a bar and restaurant, but sometimes live music. -La Maison des Métallos, 94 rue Jean-Pierre Timbaud, 11ème, M° Couronnes. A cultural center with plays, exhibitions and, sometimes, live music. -Le Babel Café, 109 bd de Ménilmontant, 11ème, M° Ménilmontant, 01 49 23 00 63. A nice and cheap café with a mix of "local people from all over the world", young students and musicians. -La Flèche d'Or, 102bis rue de Bagnolet, 20ème, M° Alexandre Dumas or Porte de Bagnolet. A concert place that is worth checking out even if you haven't made a reservation. A beautiful place, a train station on what used to be a train track going all around Paris. Also a bar and a restaurant. -Le Piston Pélican, 15 rue de Bagnolet, 20ème, M° Alexandre Dumas. Nice bar off the most trendy neighborhood, very nice atmosphere and sometimes live music. -Lou Pascalou, 14 rue des Panoyaux, 20ème, M° Menilmontant. Very nice café on a nice little quiet square off the busy boulevard de Ménilmontant. Sometimes good live music. -La Miroiterie, 88 rue de Ménilmontant, 20ème, M° Ménilmontant. A squat with mostly punk music. -Le Studio de l'Ermitage, 8 rue de l'Ermitage, 20ème, M° Ménilmontant. A concert place that is worth checking out even if you haven't made a reservation. A lot of world and jazz music. -La Bellevilloise, 21 rue Boyer, 20ème, M° Ménilmontant. A concert place that is worth checking out even if you haven't made a reservation. Also a place for dinner and brunch. A lot of world and reggae music. -La Maroquinerie, 23 rue Boyer, 20ème, M° Ménilmontant. A concert place that is worth checking out even if you haven't made a reservation. Also a place for dinner. Concerts and showcases. -Les Trois Arts, 21 rue des Rigoles, 20ème. Jourdain. A small café with live music. -Le Vieux Belleville, 12 rue des Envierges, 20ème. Pyrenées. A restaurant specialised in old typical french food... and music! -Le Zero Zero, 89 Rue Amelot, 11eme, M° St Sebastien Froissart. A little trendy bar off of the crowded places. -Le Pop In, 105 rue Amelot, 11ème, M° St Sebastien Froissart. Mostly DJS, but sometimes live music. -Le Satellit, 44 Rue de la Folie Mericourt, 11eme, M° Saint Ambroise. Basically the only club in Paris that is not racist! So, of course, very diverse and very crowd and music from all over the world, either live or with good DJs. There is an entrance fee. -L'Angora, 3 bd Richard-Lenoir, 11ème, M° Bastille. Mostly a restaurant, but live music sometimes. -Le Sanz Sans, 49 Faubourg Saint Antoine, 11ème, M° Bastille. Mostly a bar, with live music sometimes. -Les Disquaires, 6 rue des Taillandiers, 11ème, M° Ledru Rollin. Mostly DJs, but sometimes live music. Often free, and a very nice atmosphere. -L'Atelier Charonne, 21 rue de Charonne, 11ème, M° Ledru Rollin. Expensive club almost entirely devoted to gypsy musics. Also a restaurant. -Le Café de la Plage, 59 rue de Charonne, 11ème, M° Ledru Rollin. Nice small bar with live music. Brasilian music on Fridays! -Le Réservoir, 16 rue de la Forge Royale, 11ème, M° Ledru Rollin. A concert place but also one of the best brunches in Paris, with live jazz music. -Le China, 50 rue de Charenton, 12ème, M° Ledru Rollin. An old fashioned classy music club, bar and restaurant. -La Liberté, 196 rue du Fg St-Antoine, 12ème, M° Faidherbe-Chaligny, 01 43 72 11 18. Very nice cheap place, open late. La Lib' is open to people of all ages and looks and everybody communicates very openly. It's also an artists' bar and sometimes they host live music. -L'Olympic Café, 20 rue Léon, 18ème, M° Chateau Rouge. A restaurant, a café, a bar and also a concert hall with a very nice atmosphere. -Le Lavoir Moderne Parisien, 35 rue Léon, 18ème, M° Chateau Rouge. A theater with sometimes live music as well. -Le Centre Fleury Goutte d'Or, 1 rue Fleury, 18ème, M° Barbès. A concert place that is worth checking out even if you haven't made a reservation. Mostly young artists. -Le Saraaba, 19 rue de la Goutte d'Or, 18ème, M° Barbès. A cultural center that aims at representing the cultural diversity of this neighborhood, including a concert place. -Le Divan du Monde, 75 rue des Martyrs, 18ème, M° Pigalle. A concert place that is worth checking out even if you haven't made a reservation. Mostly world music. -La Machine du Moulin Rouge, 90 bd de Clichy, 18ème, M° Blanche. A concert place next to the famous Moulin Rouge. -Le Bab Ilo, 9 rue du Baigneur, 18ème, M°Jules Joffrin. A bar, away from the previous stroll, that sometimes has live music. -New Morning, 7 rue des petites ecuries, 10eme, Chateau d'Eau. Always good jazz but the prices are rising. It is a concert hall more than a bar. -Rue des Lombards (1er, Chatelet - Les Halles): some good jazz clubs: Le Sunset / Sunside 60 rue des Lombards, Le Baiser Salé 58 rue des Lombards, Le Duc des Lombards 42 rue des Lombards. -Le Méridien (81 bd Gouvion St Cyr, 17ème, M° Porte Maillot). The noisy lobby of a very classy hotel where clients are sometimes there for lack of a better thing to do. BUT they have good music. -Les Etoiles, rue du Chateau d'Eau, 10eme, Chateau d'Eau. Le Marais: then you cross the bridge again (Pont Marie) and you get to Le Marais. It is a very old neighbourhood of Paris that has very nice old streets and buildings. Walk down the Rue des Francs Bourgeois, don't miss the little Place du Marche Sainte Catherine or, of course, the big Place des Vosges. From the place des Vosges you can have access to the Hotel de Sully through a beautiful garden. You can also visit the public library rue du Figuier (near a nice free and anonymous HIV test center, Pont Marie), or the Musee Picasso. At the Metro Saint Paul, rue Francois Miron, there is a little shop that I would recommand for you to visit: It is called "Izrael" and contains the most amazing collection of random things from all over the world! Mostly food but also random stuff. You don't have to buy, just look, smell... There, on the rue des Rosiers, starts also one of the two Jewish Quarters of Paris. Worth a walk, maybe on Sunday since everything is open (but closed on Saturday). At the end of the rue des Rosiers, in the Rue Vieille du Temple and Rue Sainte Croix de la Bretonnerie, starts another "gettho", the Gay Gettho, with bars, shops and... people. That's also where you find the greatest Tea shop of Paris (Mariage Freres, rue du Bourg Tibourg). Belleville: It doesn't really connect with the others. It actually connects with nothing! And there is no particular reason for going there. But it's a nice place, one of the last parts of Paris that kept a village aspect to it, and a popular life that goes with it. Of course, it has become an "ethnic" place and you can probably find better mint-tea and couscous than at the Mosquee, and for much cheaper. Also a lot of chinese/vietnamese restaurants and stores. But there is also a growing population of students/artists/alternative scene. Shops, of course, are cheap there, with second hand clothes stores for example. 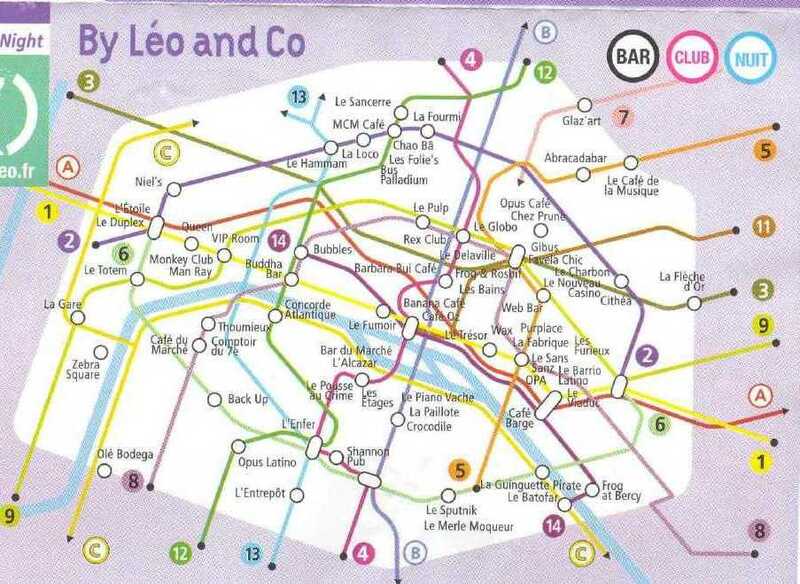 Basically, everything happens between the Metro stations of Belleville and Menilmontant, along the Boulevard de Belleville but also on little parallel and perpendicular streets, and on rue Oberkampf, between the Metro stations of Menilmontant and Parmentier, towards Place Ste Marthe and even up to the Cimetière du Père Lachaise or to the parcs (Buttes-Chaumont or Belleville)... You can eat there, brunch, lunch, dinner or have a drink during the day or at night, check the various sections. There is one night-club on rue Oberkampf, "Le Nouveau Casino". It's very nice at night but I also like to hang out there on summer week-end days when old people and children are in the streets. Another great moment is the Ramaddan, when Muslims can't eat or drink all day and therefore, at night, they go crazy and Belleville goes crazy with them, bars are open much later than usual and are filled with young people having fun and drinking, but in a very cool atmosphere. * You can walk on the "Viaduc". It goes from Bastille to Nation, along the rue de Lyon. It has been decorated with plants and trees and it's beautiful on a sunny day. It all started on March 18, 1871 on the top of Montmartre (M° Anvers, P18). It's important to know because it makes the ugly church you see on top as a landmark of hate. It used to be a field (le Champ des Polonais) in a very popular area where the people started to rebel against the army. Years later when the conservative governemnt took over, they decided that they needed to ask god for forgiveness for all of the sins of the communard. They raised a mandatory tax to pay for the church, and built this ugly "Sacré Coeur" that some people call the ugly whipped cream. In addition to an ugly history, it is also one of the most conservative (fascist) church in France, hosting some cults that do 24/7/365 prayers (only 2 such churches exist in France). Many reasons to ask for its destruction... Vive la Commune! It all ended on May 25, 1871, around the cemetery Le Père Lachaise (P20), which is one of the nicest cemeteries to visit (if you like cemeteries or some famous people there, including Jim Morison, Honoré de Balzac, Guillaume Apollinaire, Frédéric Chopin, Colette, Jean-François Champollion, Jean de La Fontaine, Molière, Yves Montand, Simone Signoret, Alfred de Musset, Edith Piaf, Camille Pissarro, Oscar Wilde or Richard Wright, but it's also very green, full of trees...). This area has also always been (and still is but all is relative) the poorest of Paris, and the last fights of Communards against Versaillais took place there in small streets and the support of the local population. The last barricade was on rue de la Fontaine au Roi, M° Goncourt, P11. Then the last Communards escaped and took refuge in the cemetery. They were followed by the soldiers who trapped them and gathered them against a wall (le mur des fédérés), to shoot them. 147 were killed. You can still see the place. CICP is a center for many alternative groups to meet, 21 ter rue Voltaire, P11, M° Rue des Boulets. Next to it there is a nice anarchist bookstore called Quilombo. Another anarchist bookstore is Publico, on 145 rue Amelot, P11, M° Oberkampf. And another, small one, is La Rue, 10 rue Robert Planquette, P18, M° Blanche. Another political bookstore is Librairie Résistance, 4 Impasse Compoint, P17, M° Guy Môquet. The anarchist union CNT has often stuff going on at their little place off of 33 rue des Vignoles, P20, M° Buzenval. Milly la Foret. It's a nice little village not too far from Paris. It has kept its middle-ages appearance thanks to the financial help of rich people around but, like a miracle, it has also kept the rural people and hasn't completely (yet!) been replaced by these rich people coming from Paris. The main square has a beautifull old woden market place and washing place. It's also in the middle of the Foret de Fontainebleau which makes the surroundings pretty nice too. Milly has, at least, two things that worth the visit: one is the chapel where Jean Cocteau was buried. Before he died, he decorated the inside and it is pretty. The chapel itself is located in a pretty garden full of medicinal plants. The second thing that worth the visit is "Le Cyclope". It isn't open all year round, you'd better check. It is in the middle of the forest. It is a huge statue (like a 4 floors house) of a cyclop head. You can go inside and visit it. The idea is from Jean Tinguely, a swiss artist (dead) very fond of art made of iron and moving mechanical parts. He and his wife, the american artist Niki de Saint Phalle, made the fountain on the Place Stravinski at Beaubourg. She also decorated the face of the Cyclop (including a huge tongue, covered with glass, that spits water!). But many artists collaborated in making the Cyclop during 25 years, and when you go inside, up the floors, you see contributions of all of them, either by decorations of the walls or sculptures, sometimes animated. To give you an idea of the size, the last floor includes a train wagon. And you can climb on the roof too. I loved it!